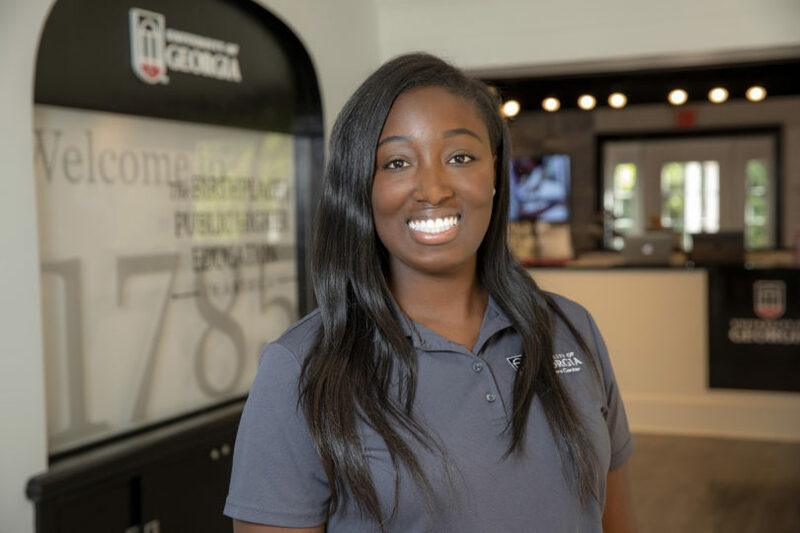 Ahlya Branch is a first-generation college student who has thrived through the connections and relationships she has developed at UGA with friends, mentors and faculty members, all of which is leading toward a career in corporate recruitment. I currently serve as a tour guide at the UGA Visitors Center. I have no family ties to the university. I am a first-generation student, which is something I take a lot of pride in. Attending the University of Georgia is an achievement itself. I am a first-generation college student so attending college in general is an accomplishment, but getting to attend this university has given a level of confidence and pride that I could never truly put into words. Though this has not been an easy journey, I am forever grateful for the opportunities and strong connection and relationships I have been able to experience here. I started my college involvement journey by applying to work at the Visitors Center. Through that job I have been able to meet potential students with a growing love and desire for this amazing university and guide them through such a tough transition from high school to college. I have also been able to work alongside some incredible students that have become close friends, mentors and role models for me. Also, I had the chance to serve as an orientation leader in 2016. That role was a defining point in my life and has most shaped who I am today. My colleagues and bosses, Alton Standifer and Meridith Balas, have been my biggest support group and have fostered this sense of community and belonging in my life and have continued to guide me well after my time as a leader ended. … of the overall sense of community I felt during my campus tour. I had this overwhelming fear that I would be another face in the crowd or another number to be reported, but quickly realized that was not the case. This place and its people do an outstanding job of making everyone feel welcomed and accepted. … devour a huge meal in a dining hall with my roommates! Sommer, Paige, Ijee and Erin, thank you all for being so willing to pig out with me on multiple occasions! … having great meals with great people. My close friend Hailee Bastien has made me aware of the fact that food is the gateway to the soul. Food always brings people together, whether that be fast food or homemade. Sharing a meal with someone can lead to so many conversations and relationships that can change your life. … go on a spontaneous helicopter ride in Myrtle Beach! I was there for a quick beach trip and decided that I wanted to conquer my fear of flying. The sudden decision left me no time to think and just go for it! … Jittery Joe’s in the MLC. It is the perfect balance of being studious and being social. It’s not too quiet yet not too loud. There are so many professors that have impacted me and shaped the ways I view a lot of things, but my favorite professor is Christin Huggins in the department of communication studies. Dr. Huggins knows how to keep her students engaged with her wit, humor and overall approachable demeanor. I took her “Empirical Research Methods” course and was always so excited to go and see what hilarious things she would say each week. … OPRAH WINFREY! I believe that Oprah is one of the most influential people today. She has a tremendous amount of poise, strength and wisdom that is obvious in everything she does for herself and others. I would love to know the key to being so resilient and having such a positive outlook on life even after facing adversity. … start an organization that would help fund the specialized interest of children in low-income areas. I feel as though a lot of children have talents and skills that can develop into something unimaginable, but because of the lack of proper funding, supervision and mentorship they are never really able to tap into those interests. … travel the world! I think everyone should take the time to visit outside of the country. It gives you an opportunity to view other walks of life and could potentially give you a greater sense of self and a great appreciation and love for the things and people you have in your life. One of my biggest passions is using my voice and allying with underrepresented groups in our country. Whether that be people of color, people of the LGBT community, immigrants, Muslims and so many more I believe that we as a nation have the ability to uplift, support and include all of these groups and more in the important conversations that shape our lives and our society. … go into corporate recruitment. I have found that a lot of my strengths stem from my interactions with people and my love for socializing and public speaking. While working in the corporate field, I plan to continue to engage in my love for travel, food and adventure. My time as an orientation leader with New Student Orientation has been my greatest accomplishment. I have found that my friendships that developed as a result of this program are some of my strongest. I would say I found my people through that process. Having to be so vulnerable with a group of strangers forced me to be vulnerable in my everyday life and that has reaped great rewards for me. I am eternally grateful to the leadership staff in New Student Orientation for taking a chance on a small town girl like me and seeing something in me that I had never seen in myself. Also, I am equally as grateful for the 11 people that loved me and guided me during those sleepless nights and for that I could never repay you all!